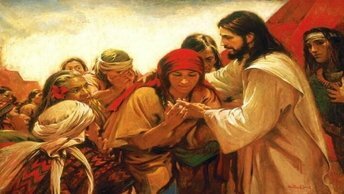 On the contrary, it is recorded that He healed “all” who came to Him (Matthew 8:16,12:15, Luke 6:19). He was never too tired, exasperated or in too much of a hurry to heal those who had faith and came to Him. Jesus came to fulfill the Father's will. He told us many times, that He came to do only “what He sees the Father do” (John 8:26; John 5:19,30; John 14:10,24). The obvious conclusion is that it was the “will of the Father,” to heal those who are asked Him to do so. And since we know that God does not change, it still must be so (Hebrews 13:8). “To save, keep safe and sound, to rescue from danger or destruction, to save a suffering one (from perishing), one suffering from disease, to make well, heal, restore to health, messianic salvation." He says that if we ask in faith, we already have what we asked for.